Nazareth, the cradle of Christianity, the city where according to Christian tradition, the angel Gabriel told Miriam that she would conceive of the Holy Spirit and the place where Jesus grew up. Today, Nazareth is the largest Arab city in Israel and has about 30 churches and monasteries alongside ancient mosques and synagogues. Nazareth, which is located in the Lower Galilee, lies in the heart of a mountainous valley surrounded by some of the most important Christian sites in the world. It is a city of religion and faith of spirit and holiness that includes a city of rich history, fascinating archeology, contemporary culture and Middle Eastern magic. 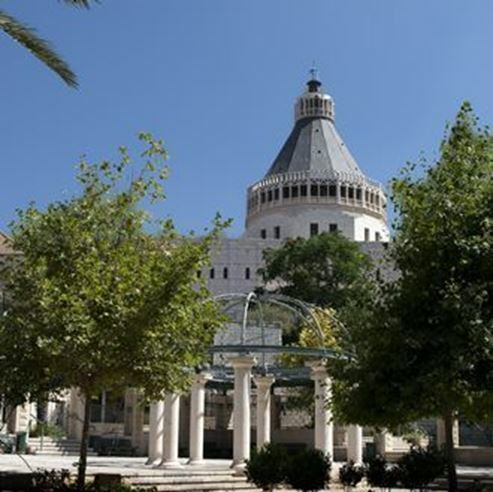 Nazareth is abundant with many churches, including the Church of the Annunciation, the Maronite Church, St. Gabriel's Church and the Basilica of Jesus, the Adolescent. It is recommended to visit the local market, which became a famous attraction due to its colorfulness and abundance of products. In the market, you will enjoy a selection of fashionable fabrics, spices, groceries, art, souvenirs, and more. Here you can touch and feel smell and taste and you will enjoy an authentic experience. Nazareth is also full of fascinating corners that will warm the heart. You can take a stroll through the Nabi Sain ridge boardwalk and enjoy the magnificent view of the Galilee mountains. You can visit the Turkish bath, showing the richness and customs of the 19th-century Ottoman Empire, and be impressed by the wonderful art. It is recommended to go to the Greek-Orthodox bishop's house and enter the system of underground passages that were discovered in the courtyard of the house. And to visit "Moscovia" - a compound built by the Russians and used as a hostel for pilgrims. In Nazareth, the Christmas Festival is held every year. Transportation in Nazareth is based on municipal buses, taxis, and private cars.